The Roman Empire in the west fell for a great many reasons. We could cite a lengthy series of breakdowns in its political structures, feckless leadership by a series of child-emperors and self-interested court officials, and aggressive and opportunistic barbarian groups. 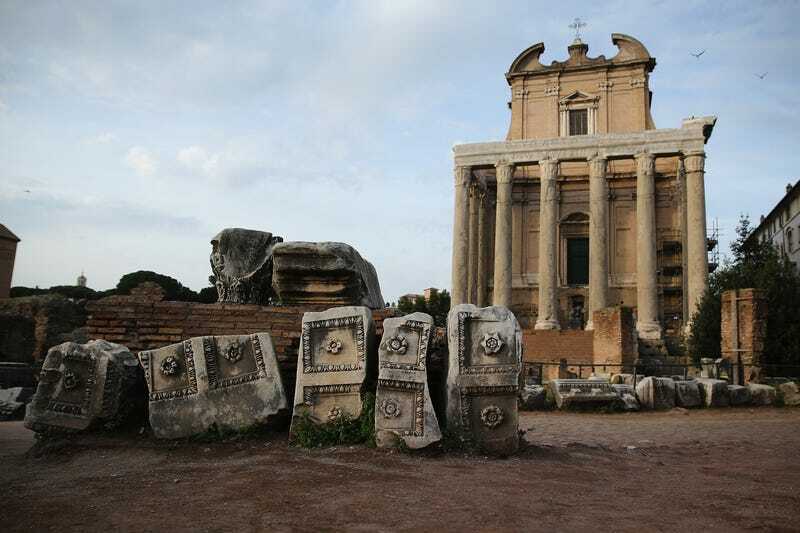 As the Empire fell apart, the whole Roman world the political unit had supported—a world of cities, trade between regions on an enormous scale, and free movement of people and ideas—likewise came to an end as the characteristically Roman economy collapsed. Historians have been discussing the reasons behind the end of the Roman Empire and the Roman world for two and a half centuries. In that time, practically every reason, from religion to mass lead poisoning to a weakened patriarchy, has made taken a turn as a causal factor. Some of those reasons are more convincing than others. A recent book makes a convincing case that we need to be more cognizant of the natural world’s role in all this. The Fate of Rome: Climate, Disease and the End of An Empire, by the University of Oklahoma’s Kyle Harper, makes a strong argument for the role of plague and a shifting climate in the confluence of political, economic, and social processes that we label the fall of the Roman Empire. In broad outline, Harper’s argument is straightforward. The age of the Roman Empire’s peak in the first two centuries AD, the Pax Romana, coincided with a remarkably favorable period in climate history known as the “Roman Climatic Optimum.” The area covered by the Roman Empire was warmer, wetter, and more climatically stable from year to year than it had been before or would be after. Additionally, that climate was better suited to the staple crops on which the Romans so heavily relied, particularly wheat and olives. The upshot was that a great deal more land was suitable for cultivation, even in places like parts of North Africa that are now desert or the mountainous areas of Italy and Greece. More food meant that it was easier to feed larger numbers of people. The Roman Empire’s investments in infrastructure and emphasis on interregional trade and communication heightened this natural boom, creating a Mediterranean-wide market for agricultural goods. Not only was it easier to grow more crops; the mechanisms were in place to move that food from place to place, allowing for urban growth on a scale that wouldn’t appear again for a thousand years. Regions could specialize in the agricultural products for which they were best suited. The combination of these different factors go a long way towards explaining why this period of the Pax Romana saw an explosion in population and economic productivity. The average person’s standard of living was as high as it would be for at least another millennium. That happy state of affairs didn’t last forever. A major outbreak of disease known as the Antonine Plague, which was probably smallpox, killed millions throughout the Empire in the 160s. The climate grew drier and cooler, then worsened dramatically in the 240s, with episodes of violent drought ruining food production even in the most fertile areas of the Empire. Another outbreak of disease called the Plague of Cyprian, which was either virulent influenza or a hemorrhagic fever akin to Ebola, took a heavy toll throughout the 250s. The Empire recovered from these disasters, but its population would never again reach the peaks of the second century, and its economy never fully rebounded. In a high-birth, high-mortality regime, sustained population growth was a chancy thing. The climate improved again in the fourth century, underpinning the remarkable recovery of the Empire under the leadership of figures like Diocletian and Constantine the Great. It took a turn for the worse again in the middle of the fifth century, however, and then violently worsened in the sixth. Harper shifts the point of greatest transition from the fifth century, the traditional ending date for the Roman Empire (476 is the best-known year), to the sixth, well after the formal political structures had fallen. For Harper, the real shift from the Empire to what followed wasn’t a matter of emperors, provincial governors, bureaucracies, or standing armies, which tend to be the kinds of things that dominate accounts of the fifth century. Instead, it’s a demographic transition, and specifically one that belongs to the 530s and 540s. Two things happened in the 530s and 540s to end that upswing. First, a massive volcanic eruption somewhere in the northern hemisphere made 536 AD the coldest year of the last two millennia. Summer never came. To make matters worse, this was a spike in a long, ongoing cooling trend, which the eruption simply made worse. Another followed in 540, exacerbating an already bad situation. That decade between 536 and 545 was the coldest of the last 2,000 years. The consequences of a drastic, rapid downturn in the climate for a society that depends on agriculture would obviously be pretty bad. They were. Second, a massive wave of disease hit in the early 540s. The Justinianic Plague, the first great burst of bubonic plague, had arrived. In addition to ravaging cities like Constantinople and Rome, it reached as far as Ireland and remote villages in southern Germany. A recent excavation of a burial site sequenced the bacterium responsible for the outbreak, Yersinia pestis, the same one that would cause the much better known Black Death in the fourteenth century. According to Harper, the Justinianic Plague was every bit as bad as its later sibling in terms of death toll; we simply know far less about it. Like the Black Death, the plague would stick around in recurrent outbreaks for the next two centuries. This helped to keep the population far lower than it had been during the boom years of the Pax Romana, or even those of the embattled late Empire. What followed those two events, Harper told me, “was an entirely different world materially, culturally, politically, and demographically.” By the time everything was said and done, the population of what had been the Roman world dropped by as much as half. There were simply fewer people, living in a far less materially complex world, by the beginning of the seventh century. If that sounds interesting to you, check out these episodes of Tides of History. In the first, I interview Professor Harper about his new book and generally pick his brain about the fall of the Roman Empire, something I’ve spent the last decade of my life working on. In the second, I integrate Harper’s ideas about climate and plague into a narrative about a family of peasants in Italy in the 530s and on, and try to understand how they might have experienced these environmental disasters. As always, I’m Patrick Wyman. You may remember my old show, The Fall of Rome. In Tides, I’m covering not only the fall of the Roman Empire, but also the rise of the modern world, with topics like the rise of the state, the Military Revolution, the beginnings of capitalism, and the Renaissance. You can subscribe on Apple Podcasts, iTunes, Stitcher, Google Play, NPR One, TuneIn, and any other podcast app you can think of. If you have any questions or comments, let me know down in the comments. You can find The Fate of Rome on Audible, Amazon, or at your local bookstore.